"A place for heightened focus: where each participant's creative energy compels us to surpass ourselves." All concerts presented by Musique à Flaine are free entrance. Concerts and class recitals are presented every year during the summer academy. Professors, ensembles in residence and some trainees perform together in Flaine auditorium and Les Carroz church. 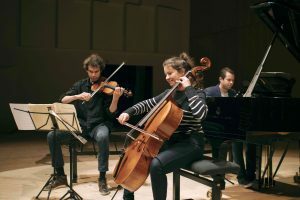 Every year since 2011, Musique à Flaine has invited emerging artists who are former summer academy trainees to perform in the Flaine auditorium in a series of concerts during the month of March. In tandem with the concerts, musicians participate in an educational outreach program with the elementary school in Flaine. 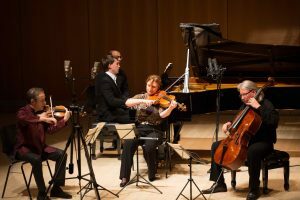 Artist’s residencies, thanks to Musique à Flaine‘s generous support have made it possible to record two CDs in the auditorium, on the Evidence Classics label. Thanks to the involvement of Flaine’s founders – passionate music and art enthusiasts Éric et Sylvie Boissonnas – Marcel Breuer and associates built the Flaine auditorium, named in honor of its founders and inaugurated in 1986. The auditorium is located at Flaine Forêt. A semi-horizontal lift provides accessibility from Flaine Forum. The shape of the building’s exterior brings to mind a grand piano, and its windows reflect the surrounding mountains. 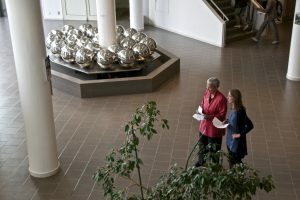 In the lobby there is an impressive glistening sculpted fountain by Pol Bury comprised of 25 steel balls and flowing water, and a diptych called Jaune Secret III by Monique Frydman hangs overhead. This 500-seat auditorium is very confortable and its acoustics are exceptional. It provides ideal conditions for both the musicians and the audience.